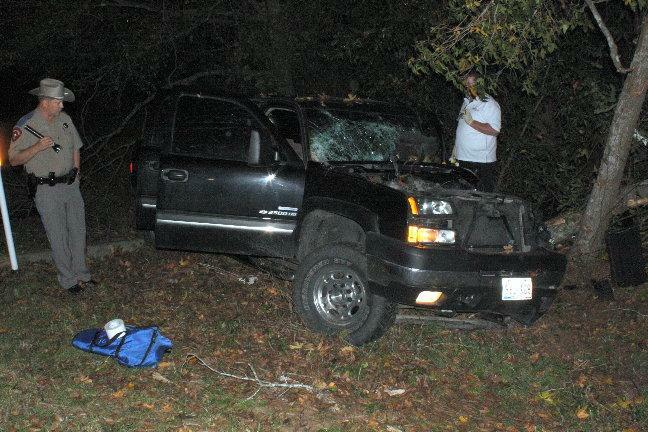 2 Hospitalized With Serious Injuries in Accident, SCHWAB CITY, November 20, 2009 - At approximately 1:15 am on November 20, 2009, a black 2006 Chevy 2500 Truck driven by Steven T. Compton, 39, of Shirley, Arkansas, was north-bound on US-146 about 8 miles south of Livingston. 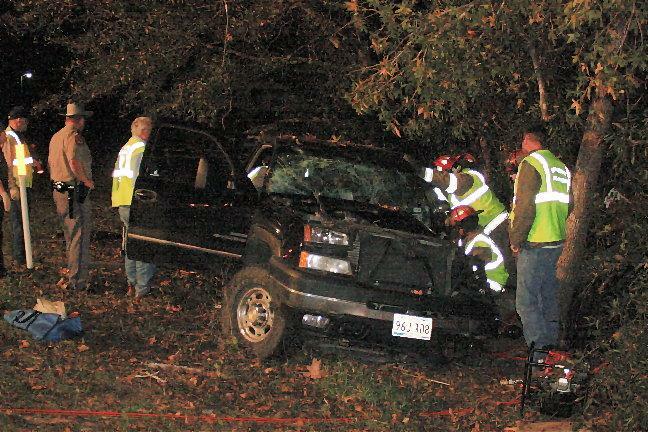 Compton apparently fell asleep at the wheel and his truck left the road to the left and struck a driveway embankment. 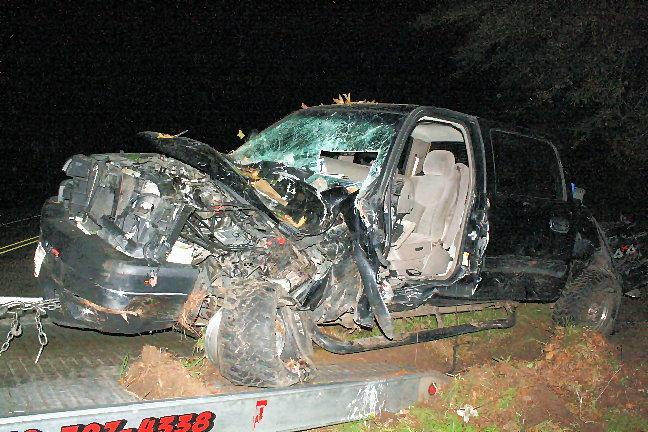 Compton's vehicle went airborne and landed sideways and slid more than 50 feet, and struck 2 trees causing the truck to turn on its side, and then finally came to rest upright, facing north at the edge of the woodline. 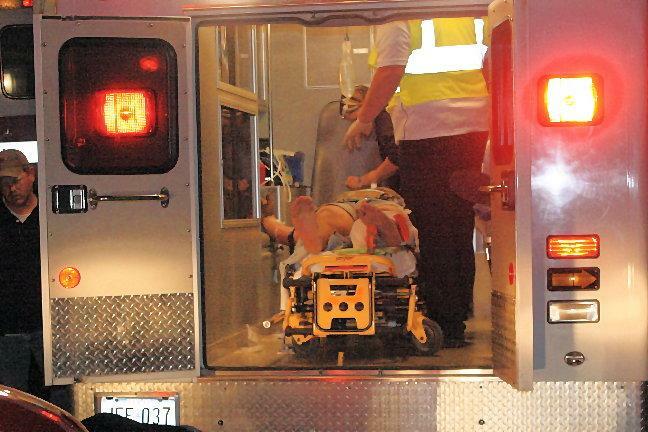 Americare Ambulance Service and the Livingston Volunteer Fire Department Heavy Rescue Unit were dispatched to the scene along with Deputy Jamie Buie and DPS Troopers Darwon Evans and David Morris. 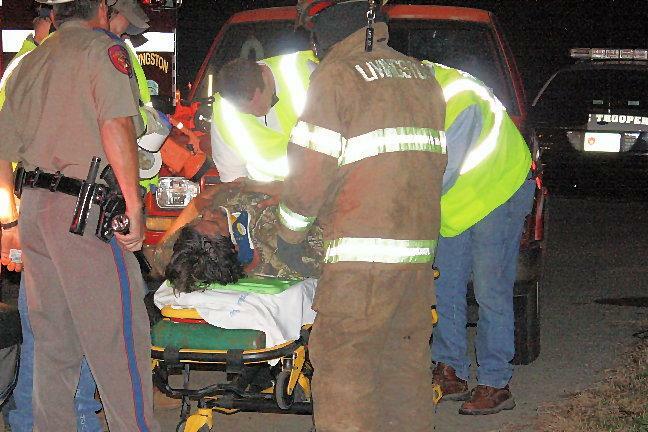 Emergency personnel were able to remove Compton's passenger, Robert Corley of Mineola, Texas who had a broken arm. 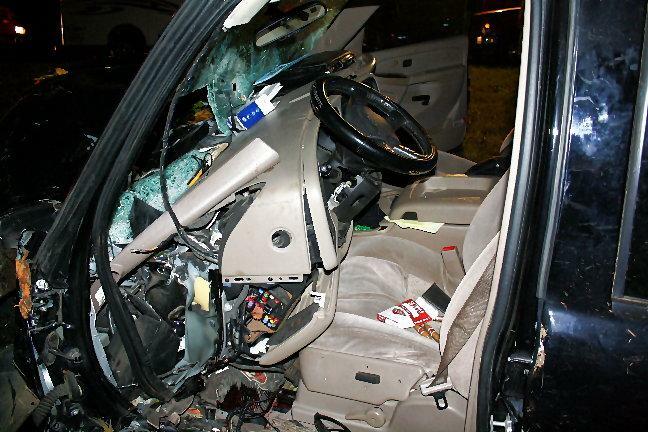 Firemen used the jaws-of-life to cut the door off of the driver's side to get to Compton who had a broken leg. Life Flight was summoned but unable to fly due to unfavorable weather conditions. 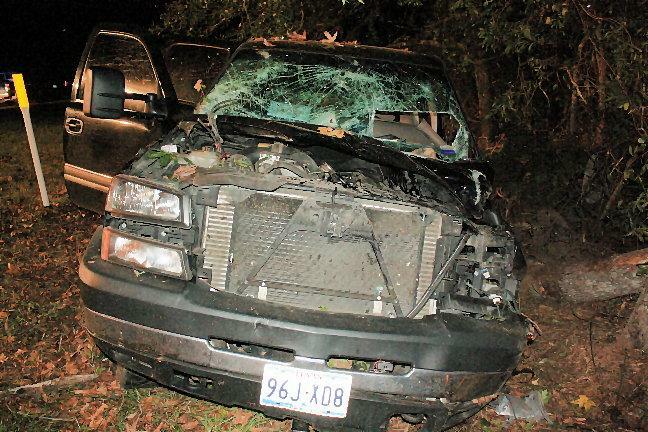 Both men were transported to Hermann Hospital in Houston with serious injuries. The south-bound lane of US-146 was blocked as the accident was being investigated and cleared. A rollback wrecker from Ken's Towing recovered Corley's Vehicle and it will be stored at Harrison Body Shop in Livingston. According to the Department of Public Safety, Compton had warrants out for his arrest from a motion to revoke due to previous convictions of driving under the influence of alcohol. Compton did have insurance. The scene was cleared by 3 am. Special Thank you: Assignment Editor Stash Anderson. 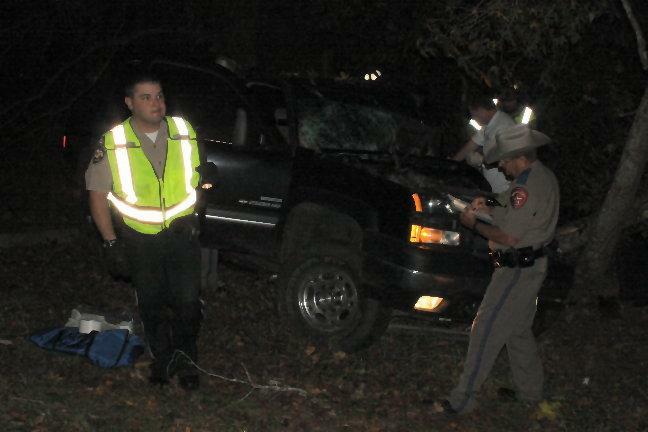 The truck slammed into two trees. Deputy Jamie Buie (left) and DPS Trooper Darwon Evans. 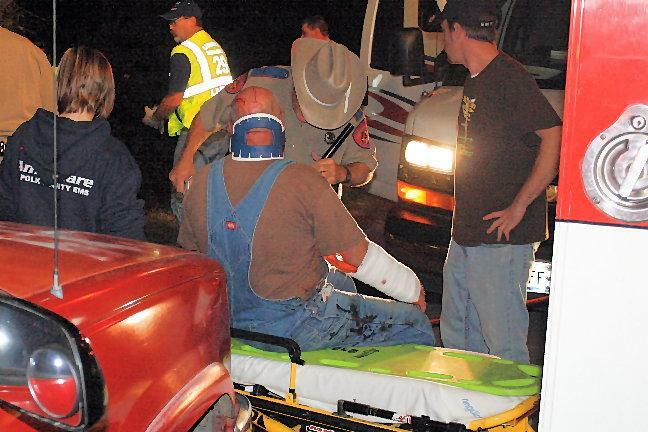 Personnel tend to passenger Robert Corley of Mineola, Texas. Emergency personnel tend to Steven T. Compton of Shirley Arkansas. DPS Trooper David Morris (left).